Flavia was raised in Rwanda by relatives, and is a proud graduate of Lycee De Kigali. Following secondary school, she volunteered with the Ubushobozi Sewing Project and initiated several projects in Rwanda. At Lafayette College, Flavia was selected to travel to Madagascar in fall 2014 as part of the Lafayette Initiative for Malagasy Education (LIME), where she helped students apply for scholarships to attend U.S. colleges. 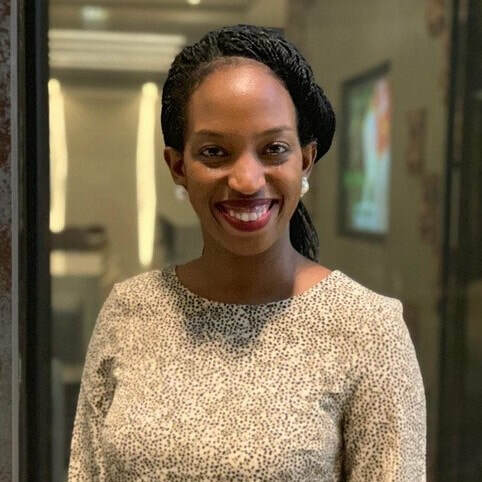 During the summer of 2015, Flavia interned with Inkomoko Entrepreneur Development for Rwanda, which is the Rwandan affiliate of African Entrepreneur Collective. Flavia spent her summer break in 2016 interning with the Solidarity Center, a global labor rights organization based in Washington D.C. Flavia graduated from Lafayette College in 2017 with a degree in international affairs. She hopes to use her education to succeed back at home and accelerate widespread economic development in Rwanda. In 2017, Flavia interned at Kountable, a multinational technology and trading company.